I know I still need to post about my trip to NYC, but can you believe that I TOTALLY forgot my camera!?! So all my pictures are on my friend's camera. Hopefully I will have some to share soon. 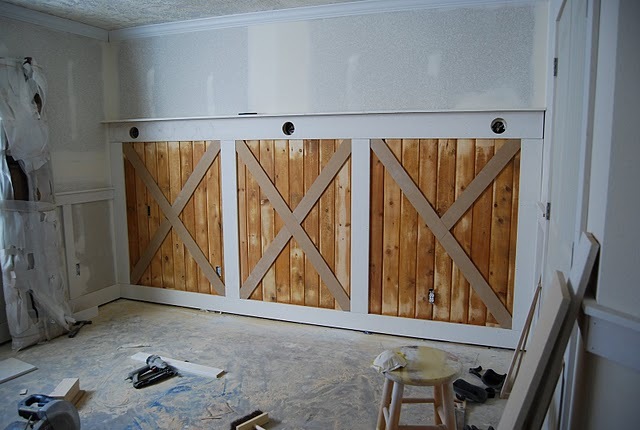 In the meantime, I wanted to post about one of my favorite trim-work projects that my cute hubby Brett did in our home!!! First...we made sure that the bottom half of the wall around the circumference of the room was NOT textured during construction. Then Brett used 2x4 MDF boards and nailed them vertically and evenly spaced out. We had a few extra planks from the salvaged barn, so Brett put them up vertically and then added more 2x4 MDF boards to break up the pattern into 3 squares. When that was done, we added the cross pattern with 1/4 inch board that Brett cut down in long 4 inch wide boards. Then he framed it in with a top shelf and base board, again with MDF board. 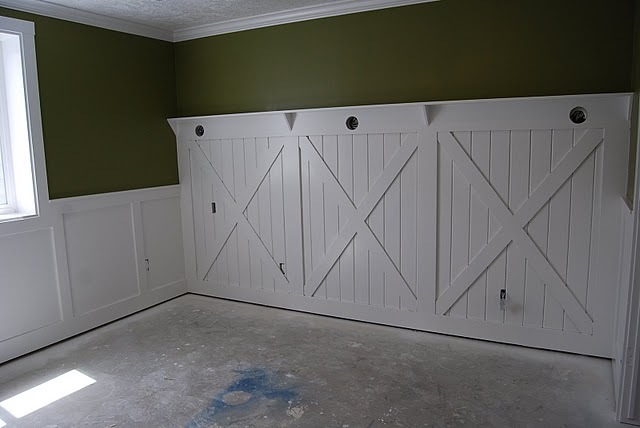 My inspiration came from my love of old barn doors! 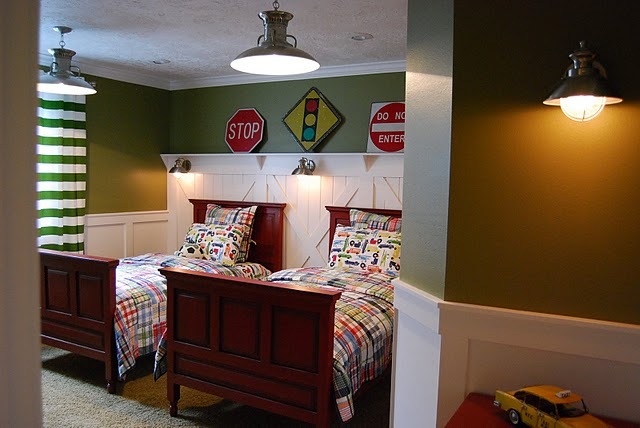 This is one of my all time favorite boys room ideas! I adore it so very much and have plans to do the same idea for my two boys! That is the color we used for Brock's room! LOVE IT! Marci!! YAY..I am so happy you ended going with that green! It was so fun talking paint with you when you were building!! :) LOVE YOUR HOME! You have such the cutest ideas! Keep up all the good work and keep all the fun posts coming! Love this idea. Such an adorable boys room! I am new to your blog. I love this room. I am getting ready to work on my son's big room which is a cars theme from PBK. Love the signs you have on the ledge. That wall is fabulous! I linked it to my childrens rooms post too today, so well done! This is such a cute boys room. I tagged to Pinterest to try to recreate for my son's toddler room next year. Wow, this is so cool! I saw it on the Favorite Paint Colors blog. I absolutely love it! What a great idea you had. I would love it if you could share your room dimensions. I have to figure out how to do a combo girl boy room in a smaller sized room. I was thinking bunks were my only option but yet when I see your pics it looks like your room isn't mammoth. I am amazed and inspired by your blog! Thank you! Where did you get the bedding? I love this so much!! Where did you get the pillows w/the motorcyle and train graphics and names? I have just found your blog and I am so excited. I especially love the bedrooms. I have told my daughter about your blog and I am sure she will love it also.